Also known as grub screws. 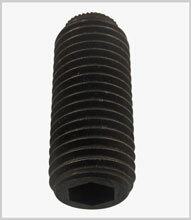 Dog point, cone point, plain cup, knurl point and flat point types, in 45H hardness grade high tensile steel. Commonly supplied self-colour or bright zinc plated, also available in stainless steel.